WASHINGTON: US President Donald Trump will meet with Australian Prime Minister Malcolm Turnbull at the White House on Feb. 23, the White House said in a statement. “The president and prime minister will discuss a range of shared bilateral, regional, and global priorities, including fighting terrorism, promoting economic growth, and expanding security and defense cooperation in the Indo-Pacific region,” the statement said. 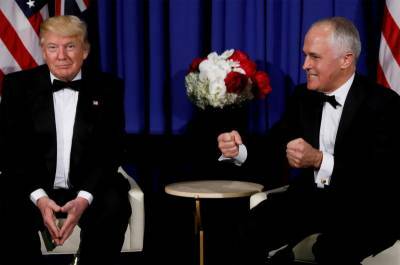 Trump and Turnbull last met in November on the sidelines of a summit of East and Southeast Asian leaders in Manila. The meeting included Japanese Prime Minister Shinzo Abe , and the three leaders discussed trade issues and the threat posed by North Korea’s nuclear program.